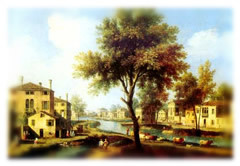 In ancient times, Padua and Venice were connected by typical river boats, called Burchielli. 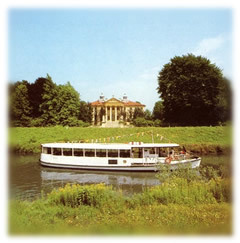 The Burchiello was a wooden boat to carry passengers, with an elegant cabin, decorated with mirrors, carvings of great value, colours and with three or four balconies, carved in a refined way. It was driven by the power of the wind or by the oars in the lagoon and then drawn by horses from Fusina to Padua, along the Brenta Riviera. 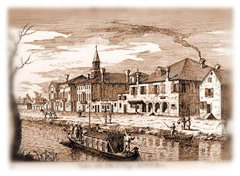 On board the Venetian "Dolce Vita" took place: noblemen and ladies, adventurers and canonicals, actors and artists created a particular and picturesque environment that made the trip pleasant to local and foreign travellers. The fall of the Venetian Republic in 1797, after Napoleon's coming, the end of the Venetian patrician power and of the pomps in the villas of the hinterland marked the end of the journey for the Burchielli. A Venetian white "vaporetto" was used for this purpose and it was called Burchiello. At the end of the 80s that vaporetto was broken up. 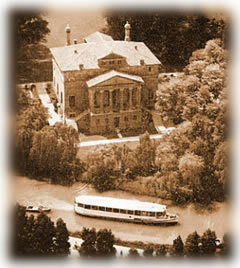 As it used to do in the past, nowadays the Burchiello operates as a long-distance touring service on the waterway called Riviera del Brenta, from Padua to Venice or vice-versa; the heir of old traditions, it slowly cruises the Brenta waters while tourist guides on board tell about the history, the culture and the art of the Villas that rise along the Brenta The programs offer navigation from Padua to Venice (Padua, Stra, Dolo, Mira, Oriago, Malcontenta, Fusina, Venice) or from Venice to Padua (Venice, Fusina, Malcontenta, Oriago, Mira, Dolo, Stra, Padua), plus the guided tour inside some Venetian Villas, the famous richly-frescoed summer dwellings of the Venetian aristocrats of the 1700's.